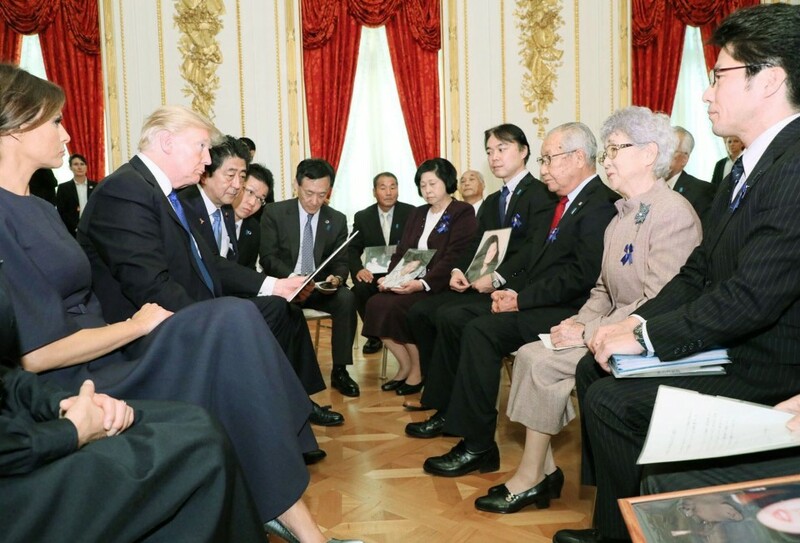 Prime Minister Shinzo Abe will urge U.S. President Donald Trump to dismiss Pyongyang's assertion that the issue of Japanese nationals abducted decades ago has been resolved when he meets with North Korean leader Kim Jong Un, government sources said Monday. Abe will meet with Trump in Washington on Thursday, before the U.S. leader's unprecedented meeting with the North Korean leader scheduled for June 12 in Singapore. The prime minister is also planning to ask Trump to convey to Kim that Japan would consider negotiating on the normalization of ties and the extension of economic cooperation based on a 2002 bilateral declaration if progress is made on the long-standing abduction issue, according to the sources. In 2002, then Prime Minister Junichiro Koizumi and late North Korean leader Kim Jong Il, the father of the current leader, signed a joint declaration in which both sides agreed that Japan would provide economic cooperation after the normalization of diplomatic ties. Abe will also seek to confirm the importance of maintaining international sanctions on North Korea, after Trump said Friday he did not want to use the term "maximum pressure," the sources said. Trump made the remark after meeting with Kim Yong Chol, a close aide to Kim Jong Un, at the White House. Tokyo officially recognizes 17 people as having been taken to North Korea in the 1970s and 1980s, among whom five were returned in 2002. Abe has said he views the issue as a government priority. Japan believes that Kim Jong Un is likely to reassert during the summit with Trump that of the remaining 12 people, eight have died and the other four never entered North Korea, according to the sources. Abe will call on Trump to reject such an assertion and persuade Kim to understand the necessity of Japan-North Korean consultation on the abduction issue, they said. Japan has continued behind-the-scenes contacts with North Korea through multiple channels. Pyongyang admits a 2014 agreement reached in Stockholm is still in effect but has not changed its stance that the abduction issue is already "settled."